Being a man comes with a lot of predisposed criteria that you must fit. There’s the manly man: the one with the full beard who carries an ax. The sensitive man: The one who has a shoulder to cry on. And the ladies man: The guy who knows what to say to get any woman. But what do each of these men have in common? The desire to look good and feel comfortable in their own way. And with things like excessive back hair or ingrown facial/neck hair, it is impossible to feel your best all the time. Luckily we at Associated Plastic Surgeons & Consultants offer laser hair removal to help all types of men to look their best. Read on to learn more. Where Can It Be Done? When people typically think of laser hair removal, they think of women flocking to the spa to get their legs, bikini area, or even their underarms done. 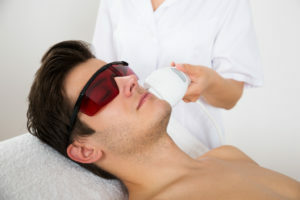 And although laser hair removal is predominantly popular amongst the female crowd, it can also be done on men to remove hair from their legs, arms, backs, neck, and even parts of the face. As a non-invasive procedure, laser hair removal is performed in the office without any outpatient recovery time. When you first arrive at Associated Plastic Surgeons & Consultants to get the procedure done, a topical numbing cream will be applied to your skin to help ease any pain or discomfort you may feel. Additionally, you will be required to wear safety glasses to protect your eyes from the laser— even if you are getting it done on your backside. Then, the technician or doctor will start the process. During the actual process, you can expect it to feel like rubber bands flicking your skin over and over again. Although uncomfortable, patients say that they quickly get used to the sensation which makes it easier to cope. Depending on the area you are targeting and the type of hair you have, you will have to undergo multiple sessions. Once you have completed the required amount of treatments, you will be eager to show off your hair-free skin. Dealing with excessive or unwanted hair is beyond annoying. If you would like to learn more about laser hair removal for men, contact the experts at Associated Plastic Surgeons & Consultants today!